Blue cheese is said to have been discovered by accident. In early years, cheese was aged in caves because of there desired temperature and moisture properties, but what people didn’t consider was their high content of mold as well. There are several types of blue cheese. Gorgonzola and Roquefort were the first blue cheeses, while Stilton didn’t come along until the 18th century. Some blue cheeses can be very sharp, while others can be rather mild. Blue cheese has a very distinct flavor and is characterized by its marbled blue curd. The blue marble is mold, which is formed from the addition of Penicillium cultures during the cheese-making process. 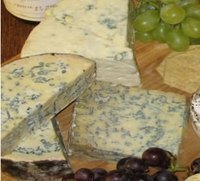 The recipe below is for one of the more modern of blue cheeses - a sharp and salty blue cheese from England - called Stilton. Sterilize a cheese cloth by boiling it in hot water for 5 minutes. Line your cheese press with the sterile cheese cloth and set aside. Remove your cheese curd from the refrigerator and drain the whey. Let the curd rest like this for 30 minutes. Add salt and mix it into the cheese curds. The cheese will not mix smoothly, but instead will form pea-sized crumbles. In a blender, blend together the blue cheese and cold water until smooth. Homemade blue cheese is made by adding rennet and p. roquefort, but in lieu of using these very hard to find ingredients, you can create the same affect by creating an inoculum. Add the inoculum to the preserved curds and toss them together. Mix thoroughly. Load the curd into your cheese press. Press lightly. The curds should not be fully compressed together. They should but retain some air space. Let sit overnight. In the morning, remove the cheese from the press and create air holes by inserting a sterile rod through the cheese every inch or so. The air holes are the key to the blue cheeses marbled affect; the mold cannot grow without the air. Rub the surface of your cheese with salt and place the cheese on a dry and sterile cheese cloth that is long enough to cover the top of the cheese as well. Cover lightly. Place the covered cheese on a non corrosive rack. This will encourage the flow and circulation of the air around the cheese. Place the cheese on an open rack in a refrigerator or other cool box. The temperature must hold at 50 degrees Fahrenheit, so the refrigerator you use for everyday will not likely work. Monitor the temperature and humidity where you store your cheese. The humidity should float around 70%. You can increase the humidity by placing a pan of water on the rack beneath your cheese. Turn the cheese each day, replacing the cheesecloth with a dry and sterile one each time you turn it. Let the cheese age for 60 days and then enjoy! If you cannot find Stilton cheese to use for your inoculum, you can use “Saga Blue”, which is the most common cheese found in US supermarkets. You can use a large Philips screwdriver as your rod, just make sure to sterilize it before poking the cheese. If you’d like to be extra cautious in your sterilization process, ask your local piercing or tattoo parlor if they will autoclave your equipment for a small fee. On very rare occasions, people who are allergic to penicillin as a drug have experienced a negative reaction to foods containing penicillin. If you are allergic or even sensitive to penicillin, consult your doctor before making or trying this cheese.